Promo value is valid for December 1st and December 2nd, 2018 from 10:00 a.m.-5:00 p.m. Boutique is open December 1st and 2nd from 10:00 a.m.-5:00 p.m. EXCLUSIVE! $25 tickets will only be offered on Conejo Deals! All proceeds from today's ticket sales are donated by Conejo Deals to Cancer Support Community Valley/Ventura/Santa Barbara, a non-profit that porvides support, educaiton, and hope to adults and children affected by cancer free of charge thanks to the generosity of donors like you! You know how stores offer holiday merchandise at retail prices before the holidays and then discount that merchandise AFTER the holidays are over? Well with today's deal, we are doing the opposite! 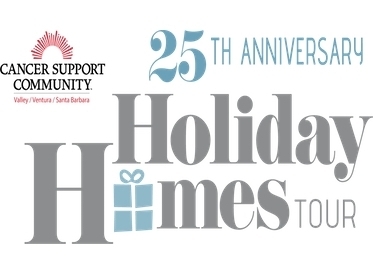 Tickets for Cancer Support Community's renowned annual Holiday Homes Tour are at their lowest price on Conejo Deals this week ONLY! For just $25.00, you can tour some of the most spectacularly decorated homes in the Conejo Valley and ALL of the profits from ticket sales go to support Cancer Support Community. (Conejo Deals does not make a cent off this deal...ALL of the proceeds are donated directly to Cancer Support Community!) Tickets purchased on site will be sold for $50 each! Thanks for spreading the word QUICKLY as today's deal expires soon and will not be available anywhere else!